A triple installation for the next generation Petronas Floating Liquid Natural Gas (PFLNG) vessel emphasizes increased demand for Intellian's 2.4m product line in the Offshore Energy and Enterprise market segments. Built at Daewoo Shipbuilding & Marine Engineering in South Korea, PFLNG Satu is a game-changer in the global LNG business. PFLNG technology dramatically improves asset mobility, paving the way for efficiency in monetizing gas resources from remote, marginal and stranded fields. To ensure redundant, seamless connectivity onboard, Petronas selected Intellian for its outstanding performance, intuitive user experience and superior remote Management & Control capability. Two v240 C-band VSAT systems managed by a Dual VSAT Mediator will provide uninterrupted operation of enterprise data applications and crew welfare solutions. Live TV entertainment will also be available via a third 2.4m system providing simultaneous reception of C- and Ku-band anywhere in the world. The t240CK features Intellian’s patented WorldView LNB and the company’s proprietary Fiber Link optical IFL solution, which delivers near zero loss between above and below deck modules for cables up to 2km in length. “It’s always especially exciting for us to be associated with ground breaking projects like this one,” declared Eric Sung, Intellian’s President and CEO. “Every system on the PFLNG Satu is the most advanced technology of its kind. Our inclusion validates the continuing dominance of our 2.4m products in the high end maritime segments, such as Cruise and Offshore Energy,” he said. “Market adoption of our 2.4 meter systems is steadily increasing for the same reasons why our 1-meter VSAT is now the most widely deployed maritime VSAT in the world. Customers value our focus on simplifying this somewhat complex technology while delivering greater performance and a truly outstanding user experience,” Mr. Sung added. All of Intellian’s 2.4m systems pack in a single shipping container and arrive pre-configured for complete build, installation and commissioning within a single workday, while alternative systems require up to 2+ days for assembly and field calibration. Experienced partners in the Cruise segment have completed up to four full builds and installations in just two days, citing the system’s practical packaging design, consistent quality, and overall ease of assembly. Floating LNG is a new energy technology enabling gas reserves below the ocean floor to be developed and monetized. 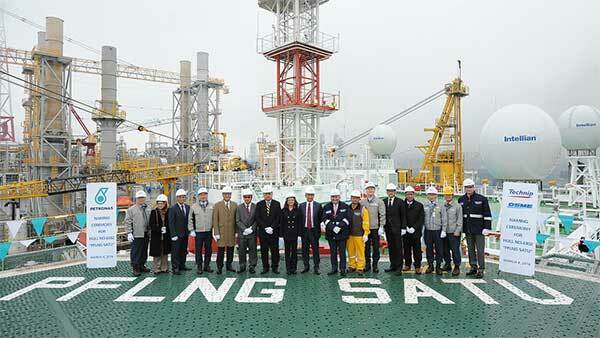 Vessels like the PFLNG Satu, the first of its type to enter operation, will be moored above gas fields to produce, process, store and offload natural gas in liquid form to LNG carriers. To do this, the gas must be cooled to minus 162ᴼ C, a process in which its volume is reduced by a factor of 600.